A bar operator on Lekki Beach Road, Ademola Ogunbona, says he has lost his livelihood to the alleged debt of N757,750 incurred by one Mrs. Shaw, aka Mama G.
PUNCH Metro learnt that the woman had gone to the bar around 6am on August 15, 2016, to have fun, which lasted till about 1am the following day. It was said that Mama G instructed the barman to serve customers that came to the bar throughout her stay, and promised to pick up the bill for the drinks they consumed. Punch gathered that one of the major beneficiaries of Mama G’s gesture was a man who came to the bar with his friends at about 6.30pm to celebrate his birthday. 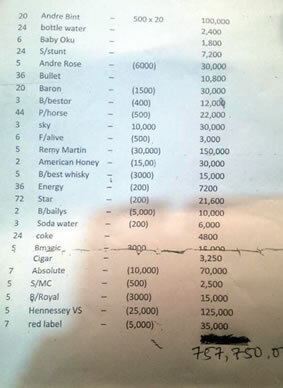 She allegedly ordered many rounds of drinks for the man and his friends and told Ogunbona to add their bill to hers. However, at about 1am, when she had reportedly become inebriated, some persons were said to have stormed the bar and took her away in a Honda car to Rotary Garden Estate, Ilasan, Ajah, where she lives with her husband. In a chat with PUNCH Metro, Ogunbona said he, two of his workers and the chief security officer of the shops in the area followed the car, but the security guards at the estate gate did not allow them in. “Mama G came to my bar at about 6am on August 15, 2016, and ordered drinks. She told me to serve everybody that came to the bar and promised to pay. In the afternoon, I told her that her bill was over N200,000. She slapped my face and asked me whether she looked like a debtor. “She said I should serve very expensive drinks to whoever came to the bar. She even called some beggars who were passing by into the bar to drink. Around 6.30pm, a man came into the bar to mark his birthday along with his friends, numbering about 16, including ladies. She told them not to pay. “They took five bottles of Remy Martin, seven bottles of Absolute Vodka and three bottles of Sky. They also smoke cigarettes. They left around 10pm. At about 1am, four men and a woman came to pick the woman. I insisted that I would collect my money, but they took her away. The father of two children explained that he went to report the case at the Ajiwe Police Division and submitted the bill to the police. He said the police invited the woman, but her husband sent a message to them that she had gone to Ghana. “He told the police that Mama G would come back in December 2016. The police sent another letter to the man in December. On January 11, he transferred N200,000 into my bank account. “I called him and asked for the remaining money, he said I should contact his wife’s lawyer. When I called the lawyer, he said I should manage the money like that. I reported back to the station and they invited his wife again. Neither the woman nor her husband showed up. Their cook and driver were arrested. The lawyer secured their bail on the same day. “Since the case was transferred to the Lagos State Police Command, Ikeja, in February 2017, the Investigating Police Officer in charge of the case has been telling me to be patient; but I have children and a wife to cater to,” he added. The husband, Mr. Shaw, terminated a call put across to him immediately a Punch correspondent began to make an inquiry on the matter. Subsequent calls to his line rang out. However, the lawyer, Mr. Onome Okodiya, who spoke on behalf of the family, said it was not true that Mama G promised to pay for the birthday celebration or was forcefully taken away from the bar. He said the matter was being investigated by the state police command, adding that the N200,000 was paid to the bar manager “in good faith” pending the outcome of a reconciliatory move by the police. Okodiya said, “We deny that Mrs. Shaw owed that kind of money. When the barman chose to use the police in Lekki to enforce the debt, we made a report to the Lagos State Commissioner of Police and the case is being investigated. We are going to wait for the outcome of the investigation.